With flu season starting back up for this year, many people are thinking back to how deadly last year’s virus was. The flu vaccine can be quite effective when it comes to preventing the flu, but vaccines don’t seem to be affecting the world mortality rates for flu deaths. It is estimated by The World Health Organisation that 290,000 to 650,000 deaths occur each year because of the flu. Researchers feel that more developments need to be made in order to decrease these numbers. A different kind of flu protection that works with all variants of the flu virus would be an exceptional development. The llama is an animal from South American that may produce special antibodies that can help. The molecules in llama antibodies can mark these germy invaders and destroy them. It helps that these antibodies are proving to last longer out of refrigeration than others. Being able to use these antibodies to target a variety of flu strains at once could be a huge development. There is a lot of work to be done in order to test the viability of this potential flu treatment. Researchers are working hard to eliminate as many of these deaths as possible. When a vaccination is created to help prevent the flu, pieces of the influenza virus are neutralised into a vaccine. When a person is given this vaccine, the body’s immune system will learn to fight the flu if it comes into contact with it again. As our body produces these antibodies, we are more apt to stay healthy all throughout flu season. The trouble comes in with the variety of flu viruses that are in the world. As the flu virus evolves, the previous year’s vaccines become less effective. Our antibodies just can’t keep up with this evolution. The flu vaccine is designed to combat the most common strains that are currently being found in the population. When the next year rolls around, you’ll need to get another shot to become immune to the new strains that are popping up around the world. Pandemics have been very deadly in the past. The bird flu was a major issue that killed many people. It is a hope by many scientists that a vaccine will be able to target all of these virus strains. This vaccine would utilise llama antibodies. How Can Llamas Help the Cause? Lllamas are part of the camelid family. This includes animals like llamas, camels and alpacas. These single-domain antibodies can also be found in sharks. It is suspected that a smaller antibody has the ability to reach the flu virus in a way that our own human antibodies cannot. This is because of our more complex immune systems and multiple-domain antibodies. Since not all portions of the flu virus are constantly evolving at the same time, this gives time to the antibodies to stop the virus in its tracks. Four different llama antibodies were fused together and held together by a human protein. Mice were injected with the mixture, and their resilience to different types of the flu virus was studied. Type A and type B flu viruses are the most common. The fused antibodies seemed to have an effective result on five different flu strains that were tested in the mice. Another aspect of the study focuses on allowing the body to produce antibodies on their own. A benign virus was injected into mice cells in a related study. The genetic makeup of the llama antibodies allowed the mice to produce their own antibodies to fight the flu. Every year you need to go back to your doctor in order to receive an updated flu shot for that upcoming flu season. Your immunities from the previous year will not have an effect on the current flu that is in your area. While this llama-related research seems to be quite promising, you can’t expect to see these llama antibodies inside of a flu shot anytime soon. Because gene therapy isn’t something that is often used in the human body, the approval process to get these treatments going would be quite difficult. Researchers and scientists are pushing the information in hopes of utilising some form of nasal-applied therapies for patients. The most at-risk individuals in the world could see a great improvement in prevention of the flu if these studies provide additional treatment options to the public. These at-risk individuals include the elderly, the very young and immune-compromised individuals. These are the demographics of patients that experience the most deaths each year because of the flu. Complications that can lead to death after contracting the flu can include dehydration, excessive fever, pneumonia and strain on the heart. Essentially, nobody is safe from complications that are due to contracting the flu. It is important to seek medical treatment as soon as you suspect complications are arising, you are dehydrated or you don’t seem to be getting any better. There are many steps that you can take in order to prevent the flu in your home. Frequent hand washing, getting enough sleep, eating healthy and staying away from people you know are sick can make a huge difference. You can speak with your doctor about the flu vaccine as a way to prevent the flu. If you do contract the flu, the flu vaccine can help your body fight the illness off more effectively. The symptoms that you experience might not be as bad as someone who didn’t receive the vaccine. 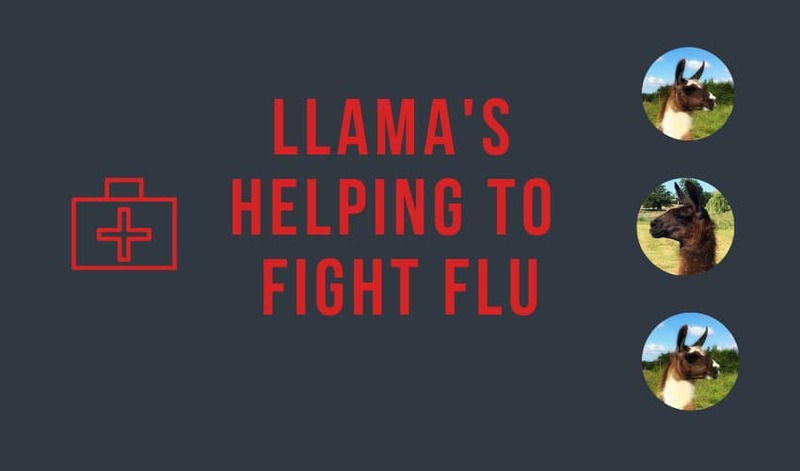 The concept of using llama antibodies in order to target the flu virus could provide treatments for other viruses. Researchers are formulating treatments for HIV. Single-domain antibodies were suggested as a potential treatment back in 2010. We may have llamas to thank in the near future when we can skip being in bed for days with the flu. ** The LLama Experience runs from March to October as we rest the boys for winter.